This revolutionary new product. is widely replacing the generator based lighting solution, the system gives a backup of 10 hours and can be recharged via solar panels or 220 v ac as well. Remote Area Light offeredcomprise optimum functionality based remote area light that find use in areas that do not have access to electricity. Finding suitability for use in areas like construction, its use does not require presence of generator and have longer backup support. Providing for complete ease of usage, these can be charged from solar panels and come with wattage options of 30 Watts LED that deliver 110 lm/ watt lume of light. Further, the lights are solar chargeable with expendable boom arm for led light and have backup of > 10 hours. These Lights are used in remote areas where one does not have ascess to electricity/ deisel etc. Thses lights can be used in construction, reducing or removing the cost of generator, the cost of maintenance of the generator and also the cost of diesel. This light Has a 8-12 hour backup and the whole system is trolley mounted for easy of use. this light system can be charged from solar panels ( provided with the light) or from a standard 220v ac input. Wattage of Led Light : 30 Watts. Expendable boom arm for led light . 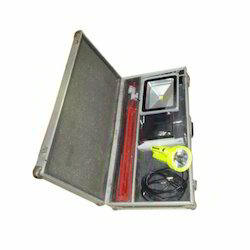 Portable Emergency Light offered by us are highly demanded among the customers owing to their high quality and reasonable prices. We ensure that what we offer is best in terms of quality and meet the variegated demand of our patrons successfully. These Portable Emergency Light are quite helpful in emergency situation, hence highly demanded. Input Current: 1.6 Amps. /Hr. Working Temp. : -5 – 50 Deg. System Charging Time: 7-8 Hrs.